Manipulating filesystem paths as string objects can quickly become cumbersome: multiple calls to os.path.join() or os.path.dirname(), etc. This module offers a set of classes featuring all the common operations on paths in an easy, object-oriented way. This module is best used with Python 3.2 or later, but it is also compatible with Python 2.6 and 2.7. This module has been included in the Python 3.4 standard library after PEP 428 acceptance. You only need to install it for Python 3.3 or older. PEP 428: Rationale for the final pathlib design and API. Main development now takes place in the Python standard library: see the Python developer’s guide. If you want to walk an arbitrary filesystem path upwards, it is recommended to first call Path.resolve() so as to resolve symlinks and eliminate ”..” components. Create a new directory at this given path. If mode is given, it is combined with the process’ umask value to determine the file mode and access flags. If the path already exists, OSError is raised. If parents is false (the default), a missing parent raises OSError. This method is only available with Python 3.3; it will raise NotImplementedError on previous Python versions. If the path doesn’t exist, an OSError is raised. If an infinite loop is encountered along the resolution path, RuntimeError is raised. 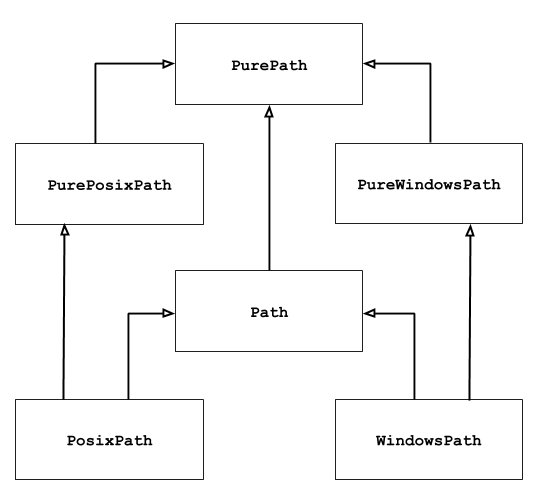 Make this path a symbolic link to target. Under Windows, target_is_directory must be true (default False) if the link’s target is a directory. Under POSIX, target_is_directory‘s value is ignored. The order of arguments (link, target) is the reverse of os.symlink()‘s. Create a file at this given path. If mode is given, it is combined with the process’ umask value to determine the file mode and access flags. If the file already exists, the function succeeds if exist_ok is true (and its modification time is updated to the current time), otherwise OSError is raised. © Copyright 2012-2014, Antoine Pitrou and contributors.